It’s all Smiles on the AZT! This morning we walked out of Grand Staircase-Escalante National Monument and into the next landscape and character change for the Hayduke: the Kaibab Plateau where we’ll walk 60 miles of the Arizona Trail. The AZT is a real deal national scenic trail with signage, a nonprofit, honest to goodness super cushy, maintained trail, and even an app. At first I was sad to say goodbye to the GSENM. It is spectacular. And with the current brouhaha in the other Washington it is under threat. Continuing to explore places within the national monument is a way I feel I can be an advocate for it. But it’s our time to move along. GSENM you are in my heart and on my mind. I promise I’ll be back. And we now get to explore the Kaibab Plateau. The highlands north of the Grand Canyon that are home to ponderosa forests, alpine parkland, and the famous Kaibab squirrel! There’s much to experience and appreciate in this part of the Hayduke. From the Wire Pass TH, we walked into Arizona, then back into Utah, then back into Arizona again where we reached the northern terminus of the Arizona Trail (AZT). Exciting! I’ve been intrigued by the AZT for years (so many trails, so many mountains, so many canyons… what to hike next?). Going south along the AZT. we gently climbed up through sagebrush to juniper and pinyon studded hills. The sego lilies, larkspur, and phlox in full bloom. The cheatgrass (awful stuff), was still green and soft, suggesting a pretty grassy slope. Sometimes, ignorance is bliss. The hillside so pretty with far reaching views of the Vermillion Cliffs. Within a couple miles we started meeting AZTers – mountain bikers and hikers – all in that state of glee and feeling the satisfaction of nearing the finish of a long journey. We chatted with folks, adjusting our mindset to being on a popular trail: talk and enjoy but be wary of standing around in the sun and not covering miles. It was Smiles! Marmot whistles and hops ensued. Smiles is an awesome woman who we crossed paths with on the CDT. We hung out in towns and stayed in the know of each other thanks to our dear friends Smudge and Groceries. Smiles was less than 10 miles from finishing the AZT! So fun to share info about routes and hear bits about adventures. Smiles is so cool to be around. She is very uplifting and a generous person. If you mention your sunscreen is running low or your Platy has a leak, she’s ready to give you hers. Someday we better hike together! Or call for a gathering of those who love The Marshmallow (Smudge and Groceries’ camper). After much gleeful chatting and beta exchange, it was time to wish the three women well in completing their AZT journeys. Gabriel and I headed south. 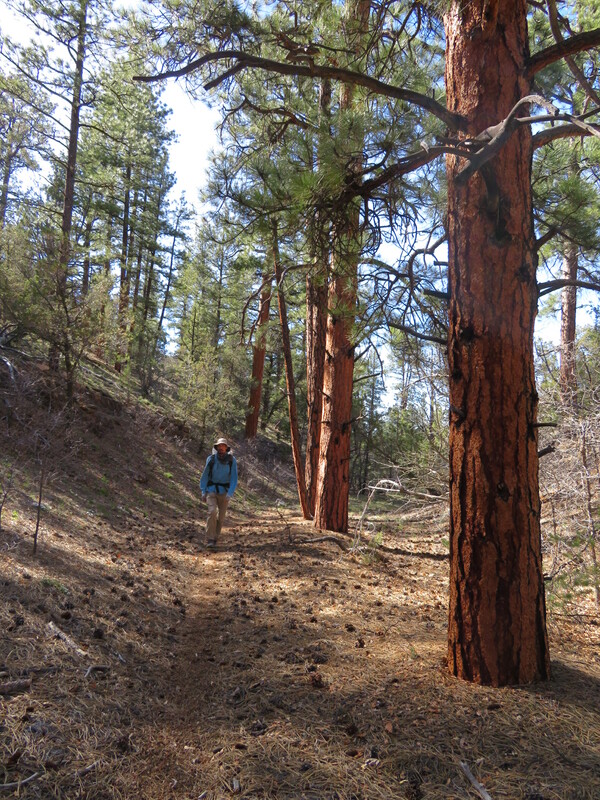 Ten to 13 miles of rolling pinyon-juniper woodland. Phlox, wallflower, paintbrush, and other flowers periodically interspersed amid the trees. The trail crunchy with Kaibab limestone under foot. And trail markers and signs anywhere there was a hint of a jeep track or road. 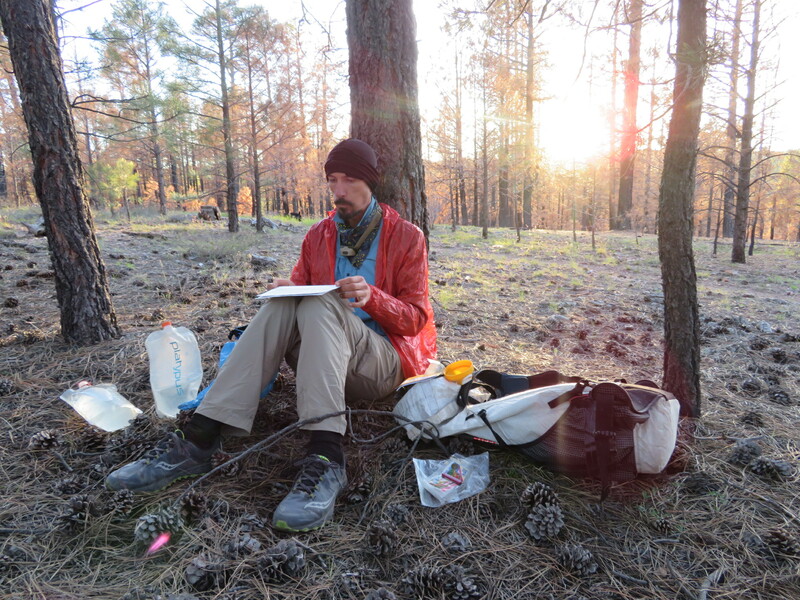 Through the Kaibab Plateau, it would be hard to stray off route of the AZT. The going was a little monotonous, even for someone who is fond of pinyon and juniper woodlands. But not feeling the call to linger in every bend made it easier to cover miles. The shade helped too, as it was a warm day. We met a few more AZTers. One from the UK, a couple from Enumclaw. Walked some woodland that looked like it was cleared for cattle. Even the Kaibab National Forest seems to be managing for cows. But what got me super excited and motivated in the later afternoon was seeing the logo for this section of the AZT: it includes the tassle eared Kaibab squirrel!!!! The last 5 miles or so of the day were in ponderosa pine forest. Old pines with tawny red puzzle piece park, clusters of young ones, lovely duff, the occasional flowering current. And also a stand with thinning and fire treatment. A burn that looked good. Really good. A mixed severity stand with some dead trees and scorching to mineral soil, but mostly a light burn that left the bigger, older pines, while culling many of the dense clusters. Cool to walk through. And in my notes to learn about. While we could have pushed to Hwy 89, the beautiful forest, good duff, and evening colors beckoned us to stay. Just before we found camp, I saw a Kaibab squirrel out of the corner of my eye! Tassle ears and voluminous white plume of a tail. It scurried up a ponderosa. Another warm night to cowboy camp amid the pines. Leaning on lovely ponderosa while eating dinner and admiring the sunset. The Kaibab Plateau is a nice place to be. Day 36: 23.1 miles; 565.7 miles total. Wire Pass Trailhead to Ponderosa forest along AZT east of Orderville Canyon. GPS: not needed; people sighted: 9 Arizona Trail hikers and bikers – including Smiles!!! and one day hiker; roads: we walked about 1.5 miles of road and crossed many. Pictures to come, having data connection challenges. Maybe you aren’t supposed to be looking at a screen when you are in National Park? Gabriel and some of the numerous AZT markers. At first, we felt like giving some a high five every time we came across them. Mukmuk and the Kaibab Squirrel of the AZT. 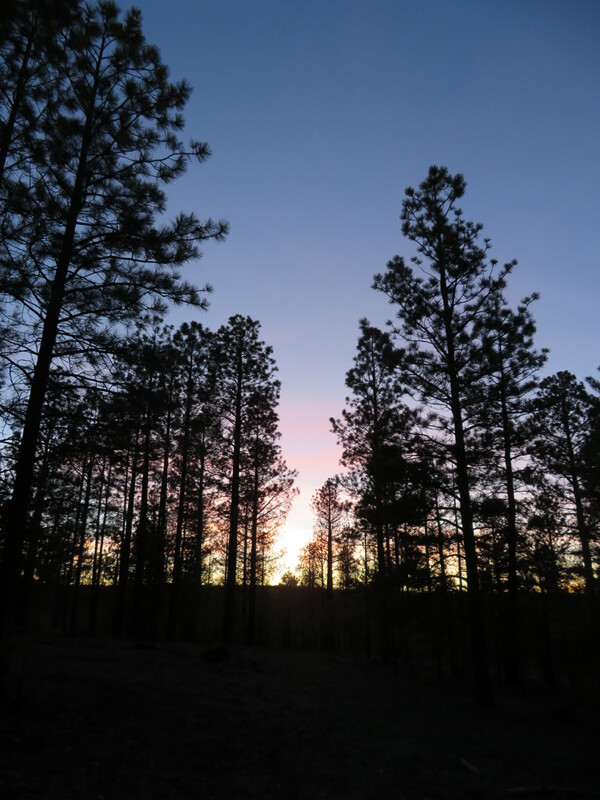 Beautiful ponderosa pines along the AZT. A nice place to have dinner and lookover our maps to add up the day’s mileage.